A is a teen who wakes up every morning in a different body, living a different life. Every Day is unlike anything I’ve ever read yet there’s a familiarity to it. There are a lot of things I loved about this book but also things I equally disliked. I loved the writing, the words felt like a train impacting on my heart – it’s heavy, bittersweet, sad, hopeful and beautiful. It’s very effective in conveying A’s circumstances and I felt like I saw and appreciated so many different lives even though they each spanned a chapter. I am very grateful to have known A, I like that A is a genderless being and I love A’s thoughts, voice and perspective. 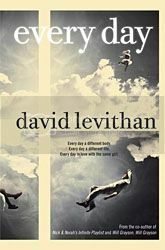 A offers so much to the reader, A makes me want to view the world differently and I think it’s amazing that David Levithan created a character that has that type of impact. A is not without flaws as there were times the character frustrated me and I struggled to accept some of the things A did. I can’t say I was ever drawn to Rhiannon, I thought she was strange and interesting and there were times I liked the influence she had on A but I never connected to her though she played an essential role..
Every Day is not a book I fell in love with, it’s a book to be absorbed, it’s a book to make one think and appreciate, it’s a slow build up of feelings while reading. I struggled with rating this book but though it’s 3.5 stars now it’s the kind of book that grows on me the more I think about it so in the future it might even be one of my favourite reads. I think everyone should read Every Day, the story may have been a bit shaky for me but the ideas and views in it should be read, known and remembered. I’ve seen this one around a lot, and the sound of A is definitely unique and so original in the YA world these days! There are always going to be those books that have important ideas and messages that may be hard to enjoy but should be read. That’s super wise of you to mention that! Lovely review as always, Isa!